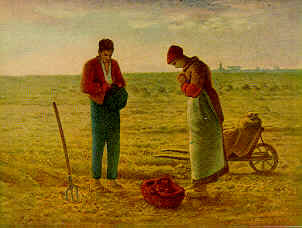 In Millet's famous painting, a peasant boy and girl in France recite the Angelus at dark. The prayer originated during the time of the Crusades as a prayer for peace and tranquility for their country. To Be Said at 6:00 a.m., Noon and 6:00 p.m.
Let us pray: Pour forth, we beseech Thee, O Lord, Thy grace into our hearts, that we to whom the incarnation of Christ, Thy Son, was made known by the message of an angel, may by His passion and cross be brought to the glory of His resurrection, through the same Christ Our Lord. Amen.